After South African director Oliver Hermanus’s controversial debut with his 2011 film, Skoonheid, which made into the Un Certain Regard category at the Cannes Film Festival, Hermanus returns to the prestigious 37th Durban International Film Festival http://www.durbanfilmfest.co.za/ with his new film Endless River. 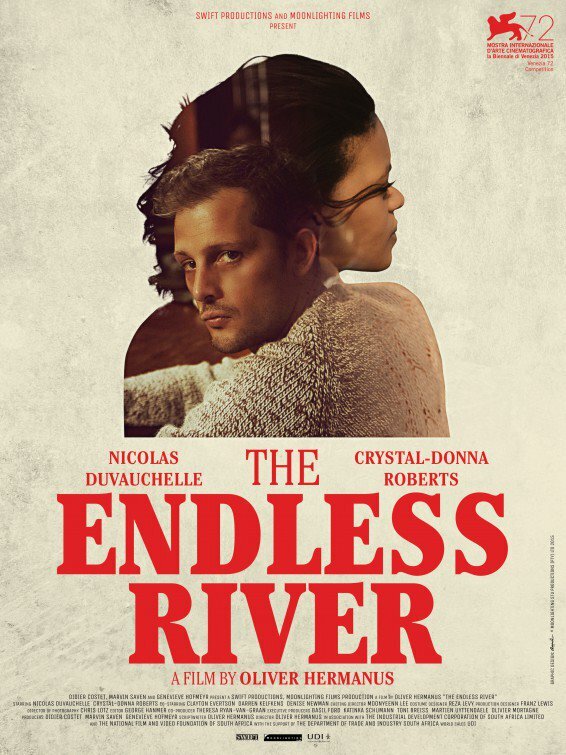 The Endless River is set in contemporary South Africa and focuses on an immigrant French family headed by Gilles played by Nicolas Duvauchelle, who suffers a heart wrenching loss when his wife and two children are killed in a brutal farm and home attack. Set in the small rural community of Riviersonderend geographically situated between Caledon and Swellendam in the Western Cape which historically got the nickname of Tygerhoek which translates into English as Tiger’s Corner. Visually, The Endless River is stylised like a Western with big bold lettering announcing the actor’s names as the opening credits appear on screen. Audiences immediately expect a dramatic showdown, instead Hermanus gives us an emotional showdown between different communities both foreign and local, angry and unforgiving. The opening shot of the film is of Giles sitting in the local restaurant chatting to a friendly waitress, Tiny, wonderfully played by Crystal-Donna Roberts, which sets the scene for these two character’s lives being irrevocably entwined. Hermanus divides The Endless River into three distinct chapters, Gilles, Tiny’s and Tiny’s gangster boyfriend played by Clayton Evertson. Soon Giles and Tiny start a tentative love affair although Hermanus stays clear of the sexually explicit nature of this affair, something he didn’t do in the obsessive love story of his previous film Skoonheid which made it so ground-breaking and shocking. The Endless River is a fascinating portrayal of mutually shared grief, loss, love and the power of two people to reconcile their differences and form a strong bond which ultimately is doomed to fail. Whilst The Endless River does not pack the same shock value as Skoonheid, except during the brutal home invasion sequence in which Gilles’s beautiful French wife is gang-raped and his two young sons shot in the bath, it is a film which resonates with provocative images signifying deeper issues in South Africa such as gang violence, the brutal crime of home invasion and unemployment. Audiences should not expect to experience a cathartic release in Hermanus’s narrative, except a beautiful if poignant yet tragic portrayal of love, loss and revenge set in Riviersonderend, a place which since settlers have first arrived in South Africa have found to be as unforgiving as it is revealing. Look out for a powerful cameo by Denise Newman (Material, Shirley Adams, Disgrace) as Tiny’s mother Mona who is weary of welcoming her daughter’s boyfriend fresh out of prison into their domestic environment. Endless River is not as brilliant as Skoonheid but judging by the packed audience at its first screening at the 37th Durban International Film Festival http://www.durbanfilmfest.co.za/ is sure to attract a curious following and is testament to Oliver Hermanus’s rising status as an influential South African film maker. Filled with some well-constructed and breath-taking images especially of Tsitsikamma forest and of the Garden Route, The Endless River is a love story born out of pain, grief and mutual mistrust.